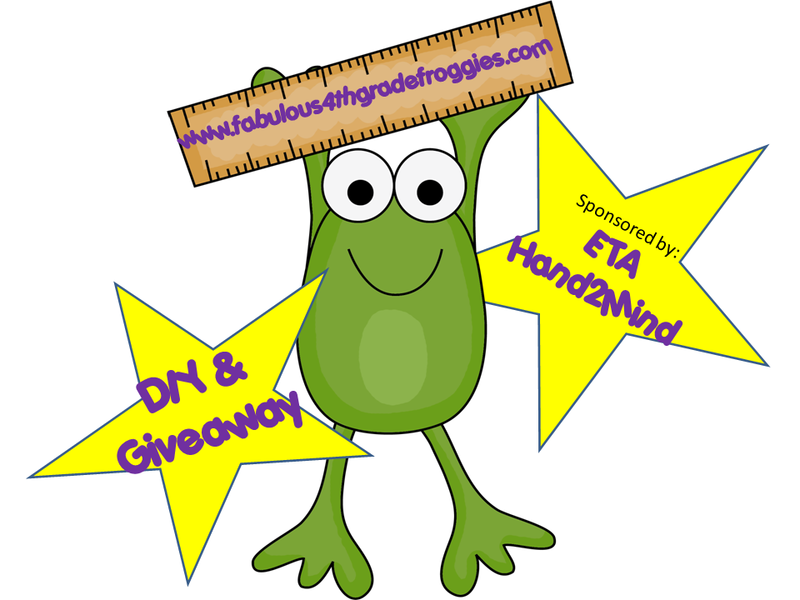 Teach Laugh Plan: Math toolkit, DIY- Monday Made It & A Giveaway! Are you back at school yet? Not me. I still have about a week before the staff development and setting up my classroom starts. However, I did meet with my team today to talk about implementing Daily 5 and CAFE, P.E.A.C.E. Club (more info coming on a later post), and making some decisions we needed to make as a team. We had so much fun talking and laughing and our meeting was very productive. We have so many fun activities planned throughout the year and I can't wait to share them with you as they occur! We have two new team members and love that all 6 of us get along so well. I hope its 4th grade's best year yet! Nothing is better then liking and getting along with the people you work closely with everyday!!!!! This is a lengthy post. Don't forget to scroll all the way down for the giveaway! As educators we all know the name ETA Cuisenaire, right? Well they have changed their name to ETA hand2mind better reflect their position as the leader in hands-on resources. Between you and me I think its a great move.....not just because it does describe the company perfectly but it's also a heck of a lot easier to spell! ETA hand2mind has given me the wonderful opportunity to review their Home Team Advantage Math Toolkit and give one away! The Math Toolkit provides manipulative-based activities, including VersaTiles, to provide a students hands-on practice on their grade level. This is the perfect product to send home with a student to help build that learning partnership between home and school. It's also awesome to use as a tutoring tool. The kit comes in this blue string backpack for easy transport and storage. There are a bunch of goodies included. The guide book you see in the picture above has a note to the families in both English and Spanish. One of my favorite items is the daily practice calendar found in the guide (also pictured above). It has 6 weeks of daily "plans" (in both English and Spanish). How awesome is that? Everything is already planned out for you and the child. The guides explains the "what" and "why" of each manipulative. Then the guide moves to the Math activities. Each activity has an explanation of the "lesson" and a corresponding practice page as seen below. I also love that each activity includes an Write/Draw Extension Activity. Here are some of the manipulatives found in the kit. The fractions towers are really cool because they have the fraction written on one side, the equivalent decimal on another side, and the equivalent percent on the third side. The fourth side is left blank. To see more specific information on the kit CLICK HERE. The Math tool kits are available for grades 3-5 and are only $34.95 each. I think I will use this with some of my students who need the extra practice and perhaps don't get the extra support at home. I plan on sitting one on one with a student and go through the activities as if I was tutoring them. Maybe I will even use it during recess once a week where I will schedule "special" time with a student where we use the kit to play games (the activities) and practice while "playing". 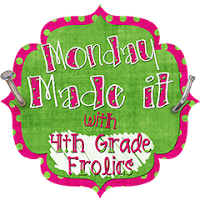 Once again, I am joining Tara from Fourth Grade Frolics's Monday Made It! The first thing I made wasn't really "making" but rather decorating. 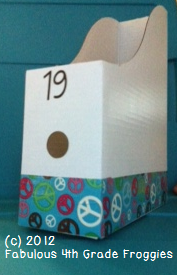 Here is an example of a student book box (for Daily 5/CAFE). I purchased 5 packs of cardboard magazine files from Ikea. They were super cheap at only a pack of 5 for $1.99. I then folded them together and reinforced the bottom of the boxes with duct tape. Then I decided to add a "stripe" of peace sign duct tape to each box to make it look cute and to make it a bit sturdier. I numbered all 22 boxes with stickers and that's it! The next project I made is a gift for each of my teammates. This is one of many Pinterest inspired projects I found to try. The "Where Are We?" signs were made from: cardboard, scrapbooking paper, ribbon, stickers, a small clothespin, and mod podge. I think the one that I saw on Pinterest was done on actual wood but I decided to try on a piece of cardboard so its lighter. First I cut the scrapbook paper to the size of the cardboard and modpodged it on. Next I put the stickers and ribbon, and clothespin down. I modpodged over the entire thing. Let it dry and put another coat on. The cardboard started curling up a bit but it was not problem flatten it down with my hands. To finish it off I added a ribbon for hanging. Come on over and join Tara's Monday Made it and see what others are making and while you are there join the linky and show us your DIYs. OK, now for the giveaway. Simply fill out the form below. Giveaway ends on Thursday, August 9th at midnight central time. The winner will be announced on Friday, August 10th. I need to buy a couple more of the Ikea boxes...love how you jazzed em up! Thanks for the opportunity to win! Love your blog. I'm your newest follower here and on FB. I really like the book boxes! Great idea to just start the year with duct tape on the book box! I always end up there anyway and this look SO much cuter! I just discovered your blog and I love it. I also joined your upper elementary linky party. I am having my own linky party at my blog in reference to the teachers pay teachers sale coming up this weekend. Check it out!! I love your where are we sign! Awesome!